The solution presented here can be made to work in 2007, 2010 or 2013. I’ll explain later. Setting SharePoint form fields using jQuery is a pretty standard practice nowadays, and not too hard either. We can fetch the current user, or a value in the query string, and use it to populate form fields, saving our users from having to do it themselves. Multi-valued lookup columns, however, are not so easy to figure out, and understanding them requires some deep DOM inspection and trial and error. Consider the form below. It could be an edit form or a new form, it doesn’t matter. They both work in the same way. Here I have a multi-valued lookup column called “Project Document” with a number of documents in the parent library. The form shows two large text boxes (‘unselected values’ and ‘selected values’), along with an “add” and a “remove” button to shuttle the parent list items between the two text boxes. Now you’d think that moving the choices from one text box to the other would be enough to “set” the value in the form, but you’d be wrong. Microsoft uses hidden elements to hold the “true” values present on the form, so in order to set that value we have to update both the visible and invisible elements in the form. The image below shows the DOM representation of the visible elements we are concerned about. This shows a 2013 environment, but the markup is the same in 2010, at least for this part of the form. 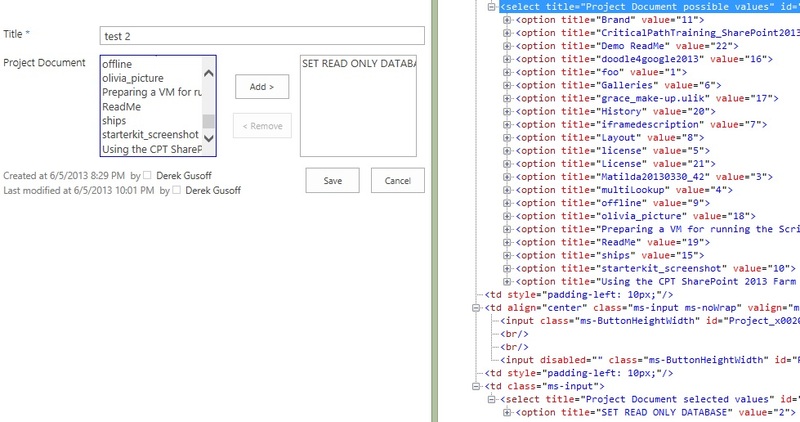 What we see here is the two text boxes (rendered as selects) along with options, about 20 or so in the “unselected” textbox, and one, titled “SET READ ONLY DATABASE” in the “selected” text box. Notice the title attributes on these selects, “Project Document possible values” and “Project Document selected values”. We will refer to these as we “move” an option from one select to the other using jQuery. The second part, the part SharePoint uses under the hood to actually save the lookup values, is a hidden input element located just above the visible UI we have just seen. “[id$=’MultiLookup’]” for 2013 and “[id$=’MultiLookupPicker’]” for 2010. In our function we will need to create that crazy string using the option’s text and value along with that pipe-T thingy, and add or remove it from the input’s value attribute as needed. A couple of things to point out. I added two variable declarations called “selector”. Make sure only one of them is not commented out – the appropriate one for you environment. For updating the visible text boxes I am using the jQuery appendTo function, a really neat function which removes a DOM element from its current home and places it into the specified location. Edit: Thanks to jameel’s comment below I fixed an earlier issue where I was hard coding the column name in the function. He also verified the 2010 code works for SharePoint 2007 as well. Tried this out and it works for Sharepoint 2007 as well (with the 2010 selector style). Thanks for setting this up so cleanly, though I was not sure why the ‘Project Document’ title was hard-coded since it would be the same as the column parameter. ahh, yes, you are right, I neglected to properly replace “Project Documents” with the parameter name passed to the function. Good catch, and thanks for pointing it out. I’ll replace it, and add your comment that it works in 2007, when I get the chance. Hm… this only seems to work if there’s only 1 multi select on the page. If there are multiple multiselects on the page, it sets all of them. I’ll be toiling away on a fix, and will let you know if I come up with one. You’ll need to refine your selector a bit to catch a specific multi-select box. In SharePoint 2013 there is a element which has the column’s display name inside it. You’ll have to fetch that, and then traverse up the DOM using parent() to find the container that holds the multi select. In 2010 there was an attribute on the tr element, so it was easier to fetch. If you come up with a solution let me know, and I’ll update the post. Good catch, and thanks! Just thought I’d offer that up in case anyone else is using it for similar purposes. Thanks for your work! Otherwise, when you’re trying to remove the value, it’s looking in the possible values listbox – which is not where you’re trying to find the item. Yeah, you are correct, I’ll fix it as soon as I get the chance. Thanks for letting me know. What version of SharePoint are you using, and what specifically are you doing that’s causing the error? I’m not able to reproduce it. Oh – and the error happens when the item is saved – not when the checking/unchecking happens. OK – so when you do a bunch of selecting and unselecting, the collection is probably getting messed up and the indexes get out of sync. You might end up needing to re-fetch the collections somehow. If you do end up sorting it out and writing that blog post please come back and link to it here, I’d like to see it. I’m curious to look into this myself, but it will be awhile before I’m able to. One thing you might try is to hold off on updating the actual hidden SharePoint controls until the user hits the Save button. That way you are not shuffling things around and potentially messing up those elements. You could look into the PreSaveAction() function to accomplish this. Apologies if my question is a bit simple but where do you call these functions? On the click event of the ‘add’ and ‘remove’ buttons? Hi Ben, how you use the functions is totally up to you. I think the most common use case for this would be to pre-load the desired values on page load based on a query string value or some other metadata. Thanks for your reply. I found your post while having problems with the multi-select list not saving the selected records in the underlying list but I managed to work that out myself. Coincidentally, I’ll need to use your solution in the near future though so thanks in advance! Hi, thanks for your help, this post has saved me a lot of time… Keep up the good work! Hi, thank you for this solution. I just want to point out that even if you are using SharePoint 2013 it is still possible that the correct ID is ’MultiLookupPicker’. We have custom forms and when we used ‘MultiLookup’ the selected values field got filled but when saved there were no values. So I checked and found out that the id for the hidden input field is ’MultiLookupPicker’ and not ‘MultiLookup’. We have SharePoint 2013 on premise and it was upgraded from 2010 (site collection is also upgraded), so maybe thats the catch. Hi, good catch, and thanks for letting me know. Yeah, it’s most likely that since the site originated in 2010 it retained the 2010 page structure. There are so many permutations of SharePoint it’s impossible to test everything. This has been verified w/ 2013. Also there’s the chance that there are other MultiLookup fields, so I made another function based on yours. I hope someone finds it useful. Is it possible to compare two identical multilookups, remove duplicates, then only keep the non duplicate values and write them to a third identical lookup? @markczamp I don’t see why not. You’d have to write some code to do that. And keep in mind that list items with duplicate titles are still different list items so you’d have to pick which one wins.